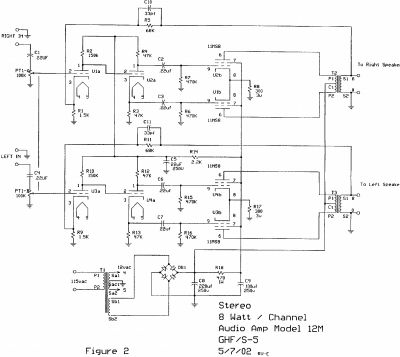 After buying and building the K-8LS tube amp kit (from S-5 Electronics) I was really disappointed with the end result. No bass at all, even through efficient speakers. Rather than use the included PCB, I intend to create a turret board. I'm going to use separate tube sockets and a case modelled after those on this site (great work, folks!). In the process, I'll wind up with a layout diagram. Has anyone out there done this, and if so, can you share your experiences? If not, is there interest in a layout diagram of my creation? Since I'm not a very bright fellow, I'm sure I'll make some mistakes and would appreciate comments and corrections. I don't have software for creating the layout...can any of you suggest a (cheap) program that would be useful for this process? If not, I'll simply draw it to paper and scan it. Also, being a not-very-bright fellow, some of the mods suggested have proved confusing to me. I'm going to try to include them in my layout and will appreciate direction and correction. This oughta be fun, ya think? BTW, the kit was $189.95 from Tube Depot. I ordered gold sockets for $3.45 each and upgraded caps for around $30. Did not plan to upgrade the trannies for now. Thanks for the heads up on the K-12! I had no idea they were back. We get a lot of people asking about these kits. Please post details of the kit when it arrives. Seems like a lot of work to do that turret board ... I'd take the easy way! I'll post information when the kit arrives and as I progress with assembly. Yes, creating the turret board will take some effort, but I'm hoping this will make it easier to "tweak" things. My thinking is that a layout paired with the schematic will be instructive to other site members. I admit to struggling with converting a schematic to a layout! Thanks for the software suggestions...I'll do my best to make things legible. Another observation: turret boards are not difficult to make. The most important tool is a drill press to drill holes for turrets. For most operations regarding amp building, a drill press is useful for drilling holes in a chassis and making mods to an existing circuit board. You don't need a big one. Drill press, that is! Cool, thanks for sharing. If you get a chance, can you post photos of the kit contents. FWIW - if you are looking for enclosure ideas, take a look at the Gallery of S-5 Electronics Tube Amp Kits. Thank you, Gio. I'll post pics, but the contents are pretty pathetic looking! I headed to radio shack this afternoon to get input and output jacks that can be chassis-mounted, as well as a lighted power switch and stereo volume pot. I'm going a little crazy trying to come up with a turret board layout. I've never done this before and translating the PCB traces is giving me a headache! There's probably a process for doing this; if you have suggestions please share. Please!! For the enclosure, I will definitely be modeling mine after the photos in the projects section. Here is the S-5 Electonics K-12 Tube Amplifier Kit which I built. If I were to do it again, I would have kept the inputs on the front and I would put the power transformer on one end with the audio output transformers on the other end and rotated 90 degrees. BTW - I just checked your K-12G schematic with my K-12M schematic and the only differences are the tubes and two resistors R8 / R17. 150R/3W with 10GV8 tubes versus 300R/3W with 11MS8 tubes. Hi Everyone, I'm glad to see the return of this amp kit. Always was lots of value for the $$. Many good mods for it and it can become a very good amp in a modest system. I scrapped the K-8 I had for parts. it never lived up to its potential (I believe that is the politically correct way to say it wasn't any good). Hope you enjoy your kit. Lofton sent me a photo of the kit contents. The contents look pretty much the same as my K-12M kit with the exception that the power transformer looks larger. That is good as the original transformers ran a little hot.